Our company is a well known manufacturer of a wide range of material which is used for the purpose of industrial packaging in the factories. The Transparent Rigid PVC for Boxes which we offer to the customers are high on demand and they are very sturdy in their functioning. Our products are made available to the customers at reasonable rates in the market. Our company is engaged in manufacturing and supplying of wide range of Industrial Packaging Material that include Blister Packaging, Envelope Window, Garment Packaging Material, Men's Suits Packaging Material, Pharmaceutical PVC Films, Transparent Box Packaging, Thermoforming & Vacuum Forming, Polyester Film & Sheet, PVC Films and Products, Pharmaceutical PVC Films, PVC Stickers, Plastic Sheets For Photo Albums, Plastic Covers For Files/ Folders, Plastic Covers For Files/ Folders, Plastic Sheets For Photo Albums, PVC Stickers, Shirt Collar Packaging Material and Soft (flexible) PVC For Calendars. These products have the tendency to accomplish the need of the customers. Our company possess ultra sound manufacturing unit that has all the required machinery and tools to enhance the production rate and quality of the products. We are enormously supported by our team of professionals who are highly experienced in this industry and helps us in achieving the organizational goals. Our products are manufactured using the best grade raw material and advanced methods of production. 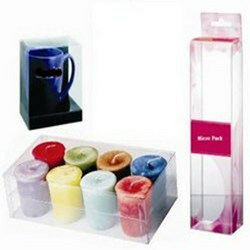 We also customize the products as per the clients' requirement and deliver them timely.